I’ve been looking forward to a much needed holiday in the US this November. On Tuesday night, I checked my passport only to discover that it will expire in December this year. As the US requires at least six months validity on the passport, I thought I could hop on the passports website and easily renew my current passport. Boy oh boy was I wrong. What should have been a quick and painless process turned out to be a case study for a bad user experience. Having what I thought was a current and valid passport, I selected the Passport Applications menu item, then the Renew option. After following the form flow for a while, I got stuck on the login screen, was eventually locked out and then asked to contact the passport team (the number only works if you call during business hours). When I called the next day, I was told that I can’t renew my current passport as it has less than two years validity (thanks to a name change due to my marriage two years ago). Instead, I’ll have to go through a new passport application. After going back and being a lot more through with my reading of the extraneous text on the passport website, I discovered that there’s actually a PDF that you have to download and read which contains important information (can you spot it in the image below?). I also discover that despite the page saying that you should use the renewal form if you have a current passport, you still need to find the relevant PDFs on the website, read the instructions in great detail and hope that you have the right form. This was pretty annoying but I buckled down and tried to work my way through the online new passport application. The first page I get asks a series of questions (as per the following image). Note that the supplementary text for the third question “Do you want to renew your Australian passport?” doesn’t tell you about the less-than-two-years validity rule. Once you start the form, there is no clear indication of the documentation you need to have to complete the form. As I start completing the form, I soon realise that there’s eleven steps I need to go through. Each step has to be completed before you can move to the next step (which is an absolute pain if you’re trying to work out what documents you need to have prepared BEFORE you get to that step). The step that’s currently causing the most angst is the citizenship section. I have to prove that I’m an Australian citizen – either via an Australian Birth Certificate (which I don’t have as I’m born overseas) or an original Australian Citizenship Certificate (which I also don’t have as I’m on my parents’ citizenship certificate). The Citizenship website tells me that I can apply for proof of citizenship, which is a 12 page PDF form, costs $55 (Australian dollars) and will take about 30 days. This is a problem – I leave for the US in less than 30 days. I call Immigration who tells me that I have two choices – apply for my own citizenship certificate (which won’t arrive in time, unless I can prove that there’s a compassionate reason like death in the family) or use my parents’ original certificate (which is still located on the other side of the country). 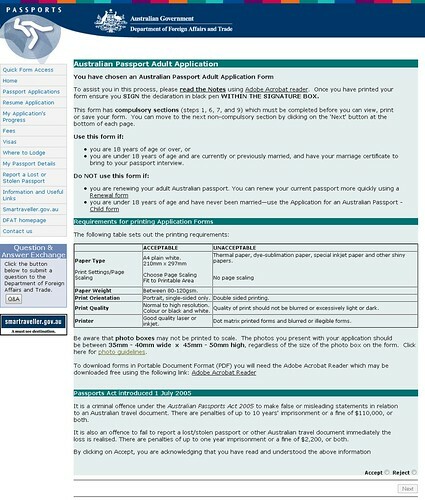 From today, the Australian Passport Office will only accept the new passport applications forms which were introduced on 1 July 2008 to strengthen the identity management process that underpins the Australian passport issuing system. The new forms better ensure the names included in replacement passports match those recorded on state and territory births, deaths and marriages registers or the Australian citizenship register. I wonder how they thought I got my original passport? So to fix up potentially erroneous processes from previous years, the Australian Citizens has to undergo quite a difficult process to apply for a passport. I’m still in the process of applying for a new passport. I’ve asked my parents to send their original certificate through registered mail so I can get it safely and on time. But funnily enough, I’m not the only person to be going through such a bad passport user experience. Map out the entire user experience – the experience can be harder that you think and it’s not just limited to the web! Rewrite your content so it makes sense!!! Give yourself ample time to renew or apply for a passport, especially if you need to prove your citizenship! God Ruth, it sounds like a total nightmare. Dealing with the government can sometimes be straight out of Kafka. I’m sure things will work out. I’ll feel a lot more comfortable once I get my parents certificate in hand. But I think it’s time for me to go cough up the money and apply for my own citizenship certificate…. I googled passport nightmares and found this! And your advise for the gov’t is right on the mark. They need to map out the experience and consider writing an instruction booklet with references to each section on what is or is not acceptable. I just became a citizen on 2 Oct. and found out on the 6th that I need to go home (Florida) because my mother is gravely ill. I picked up the application, got the pictures, had a lovely woman complete the guarantor section, took the form in for the interview and found that she had not filled in her birthday. Also I had filled in my name (’cause it’s an easy one to mess up and I only had one form). Rejected! She didn’t fill in her birthday and no one but the guarantor can fill in anything in the guarantor section. Okay, it says @ the top, to be filled in by the guarantor. But then the interviewer says to have her fill in the “0” before any single digit dates. Now that is not in the instructions and no where on the form. So, being good and knowing I can’t fake her handwriting, I make the 45 minute drive back to her town with a new form, which she starts to fill out in blue ink! “Oh, no”, I say. “It must be in BLACK INK.” She carefully writes over the blue ink in black and we check each box is filled where needed. Next day (day 3 of this drama now), I take it back to the P.O. And again, REJECTED! Why? Because she over-wrote the first section in black. “What’s wrong with that?” I say. “She should have initialled it”, he says. Now THAT instruction is no where on the form or in the instructions. But he’ll call and check with passport dept. No, they tell him, she should have crossed it out and re-written in the blanks left. So now I have two corrections that should have been made by the guarantor and NO INSTRUCTIONS ON THESE CORRECTIONS IN WRITING ANYWHERE IN THE FORM’S INSTRUCTIONS! I asked where is the direction for these corrections. No cogent answer. Now I’m pissed off. My mom is dying in Florida and we’re quibbling about blue and black ink and the passport experts can’t even agree on how the overwriting error should have been corrected. I called the passport dept and got Michelle, who had the nerve to say it would have been better to have left it in Blue Ink!! Huh? But, she says, the correct correction would have been to cross out the mistake, initial it and then rewrite it in the blank spaces available in Black Ink. I suggested that maybe they should consider putting out a booklet on how to complete each section of the form if they are going to be so precise about what they are and aren’t going to accept. She said that they don’t put instructions on making corrections because they don’t want mistakes made. They must live in a perfect world. Or don’t care about people in the real one. I’m betting on the latter. So I’ve gotten a very nice man to complete my third try at the quarantor section of the form. I’ve looked it over and I believe that he’s done everything correctly. But I won’t be surprised if there’s something wrong. And that it is something not addressed by the directions. Tomorrow it will be day 5 of this mess, and I had expected I would have my passport by then. The people kind enough to fill these forms for me are both professionals born and raised in Tasmania and I hope I don’t have to bother them again for the government’s lack of clear instructions in this area. Oh Robyn, what an absolute nightmare! I’m so sorry to hear about your mum and the passport nightmare. I hope everything works out for you and that you have a safe trip to the US and back! We also have similar problem to renew my husband Australian passport, we not able to continue it saying your information is not matching please check again. After tried and tried again we gave it up. to ring 131 1232 not getting anywhere. Now how can we renew the passport or to get the blank form? I wish you will tell the story to current affair or today to night about passport nightmare. I signed my son’s renewal passport application while I was in Australia only to find that it was rejected as my signiture went outside the sign box. Now I am in Guinea and no way of resigning it so the passport can be processed. My wife and son are planning to travel on the 28th May. If I do the application on line it renders her application useless. What I need is a blank form so I can sign the back page so it can be processed. I came across this site by accident, and while I can relate to the stories, they all seem so avoidable and easily explained. Im planning a trip overseas with my girlfriend who has no passport. She was adopted at a young age, so also has no birth certificate. After a brief bit of checking, we managed to obtain the original birth certificate from BDM (in 3 weeks instead of the 5-7 quoted). So many of the problems in these comments, seem avoidable. If you dont have sufficient information to complete the form you simply click the ‘save’ button and the website will put your application on hold until you CAN obtain the relevant details. The passport site and passport form explain in great detail what identification requirements are required, and in our case even provided links to the BDM website to obtain replacement documents. As for over-writing in a different color, when the mistake should have been initialed, I thought this was common knowledge? I remember first being taught the importance of it as a child when I made a mistake on my dollarmite deposit form at the bank. Cross out and initial. Even if you dont think its required, its (apparently not) commonsense to do it anyway. But, I think the biggest problem that seems to be shown here, is people thinking they can get a passport from start to finish rapidly. While the internet has made some things in life easier and faster, I hope that for our nations sake, our government continues to be picky about passport and immigration issues. Im sure if you explained this issue to a 60 year old, that you couldnt get a passport in under a month theyd look at you like a kid of the computer generation. To anyone not raised in the 90s, get used to the fact forms take time to process through government. Im not saying they should be picky about going outside the line or using the wrong color ink, but Im sure if you tried to deposit a cheque that youd over-written in a different color, youd expect to have issues with it too? Or would you expect to be able to fill in a cheque with crayons and argue when its rejected? I just saw at the top of this page, Ruth you live in Canberra? You are aware that the Australian passport office for the southern hemisphere is located in Barton? They should be more accomodating of any issues than the post office will be, and at the very least will have spare forms and information to hand. I also wonder, living in the nations capital, with over 300,000 people, why did you have to drive almost an hour to find someone who knew you to fill in the form, that sounds like making more work for yourself just for the sake of it. David M, you seem to be missing the point being made in this blog. It’s about the overall user experience and good design, not whether a user can navigate their way successfully through and win the ‘I’m so good’ award. Ruth, as a User Experience professional, was commenting on the overal user experience and poor design. There were other points made in the original blog that refer to usability and interaction design principles – these serve as reminders that forms are complex and should be designed properly. I’m sure that Ruth knows that there is an office in Canberra but when completing a form online, a user should not be required to attend an office to compensate for poor design and lack of integration between government departments. Hi guys, the saga continues… i tried to go through the renew a passport process… on the third page it asks for the name of the guarantor… that was 7 years ago!!! are we really expected to remember that??? I recently went through the process of renewing my passport. In my case it was simple. I did fill in and print the PDF document, went and got new photos and lodged the rewewal at the post office. About 5 or 6 days later my new passport arrived. A key to this was that I was renew the passport while it was still current. That cuts out a lot of pain as you don’t need the documentation required for a initial passport issue. Even if it has expired in the past 12 months, it is simpler than if it expired more than 12 months ago. Ruth’s situation was complicated by her name change. But for simpler cases, the process does seem to work. @Andrew – you’re right, the situation was complicated by my name change but was further complicated by the then-new rule changes. What made the experience so frustrating was that I actually had a current passport. The problem was around the labelling used on the website. As a user, I was expecting to ‘renew’ my passport rather than apply for a new passport. But as you mentioned, the idea of continuous improvement is a good pragmatic approach for Government. 1. My printer didn’t print the application dark enough. 2. I wrote the registration number for my birth certificate wrong even though that is how it was written on my birth certificate. 3. I didn’t photocopy my previous passport properly and that they don’t have photocopying services at their post office. I was so annoyed. On their website they should have clearer instructions. It’s a waste of my time. I had to get a child passport last time because I was less than 1 month away from turning 18 but I was still considered a child and that passport only lasted 5 years. Now I need to apply for a new passport and it has been one of the most complicated processes I have done in my life. In reality it isn’t that difficult, the Government just likes to tip toe around the subject of getting a passport so you’ll have to visit a million places to get all your documentation and what not right. All post offices should at least have a photocopier, I don’t mind if it’s slightly more expensive, it’s more convenient. I personally never wanted an Australian passport remembering how difficult it was applying for one way back in 1996. Come 2009 im heading to the UK so i apply for a UK passport so i can actually do some travel rather than just get out of AUS. A year and a half later, 6 weeks before im due to go back, im told i cant get back IN to australia without an aussie passport. My problem is – Photo guarantor with an australian passport. Even tho ive selected applying from overseas. They want me to find someone here… that has known me for 2 years…. that has an Australian passport. Figure that one out. From the impression im being given, DFAT dont want people who have left the country back! Im on the verge of literally renouncing australian citizenship. At least then i could get a damn £10 tourist visa! Australian passport service are a pack of criminals as far as im concerned. The Australian Passport Office makes me ashamed to be an Australian Citizen. Im so disgusted by the treatment I received that I would also consider renouncing Australian Citizenship. This is not something I take lightly and I am 100% serious. It is disgusting the errors they make and the mindless employees they hire. We should contact the State Government or NSW Government to complain. What is the most disgusting is that there is only one manager at the Passport Office and if that person behaves inappropriately there is no alternative manager or supervisor. Pathetic small town mentality and ignorant and mentally incompetent management. I agree with you 120%. The most disgusting thing is that I lodged a complaint against the Passport Office Manager who called me constantly threatening me, years after my passport was issued because they are being audited and there was some issue with the mailing and residential address. I was a teenager at that time of that application. Im actually thinking of filing a restraining order against this man. Its that bad. With these thugs calling themselves the Government it makes me ashamed to be Australian. Ive never actually felt that way until now. I have similar problem now. I am staying overseas, and my passport was damaged by water, so I have to apply a new passport. The requirements of the guarantor is extremely strict to me. I cannot find an Australian citizen who is over 18 yrs old, AND not my relatives, AND not my spouse or de facto relationship, AND not live with me, AND knows me at least 12 months, AND possess an his/her Australian passport for over 2 yrs. Although there is an alternative, which is a person who work in specific occupations. This knid of people are even harder to me to find, so I cannot apply a passport until I can find someone who meet ALL the requirements. Staying overseas without a passport is really inconvenient and dangerous sometimes, but the worst thing is if my current visa is going to expire soon and I still cannot find a guarantor, does it mean I cannot leave and have to stay in the country illegally? Without a valid passport, I can do nothing except staying at home. Just hope that Australian government can concern about these issues and take more care about its citizens particularly when they are staying overseas. Extremely tough process of passport application do make people frustrating. Some processes and requirements are not necessary. For example, although my passport was damaged, but I still can provide it, and all the information of my passport was stored in the system, and they were certified when that passport was issued, so why all the documents including citizenships, identity, even gender, place of birth have to be provided again again and again? Is there any possibility that the place of birth may be changed in future? 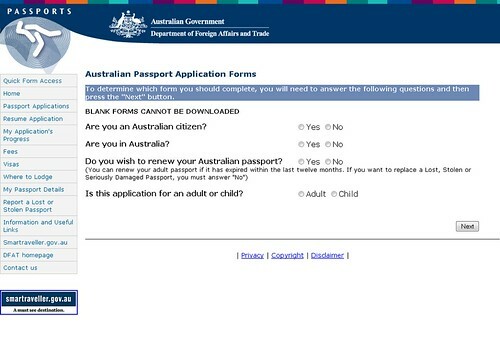 I really cannot understand it…Probably dual citizenships can deal with the Australian passport application issue. Never experience such a tough process of the passport application. Sigh, I have to continue finding a guarantor so that I can get the new passport to leave. Sorry to hear about the difficulties you have encountered. Have you considered visiting your local Australian Embassy? The staff may be able to help point you in the right direction. Hi Ruth, as the local Australian Embassy is pretty far from where I am staying, so I contacted them by email. Unfortunately they just physically followed the criteria listed on the website. No exemptions or alternatives apply. When I tried to talk about my current tough situation, no reply anymore from them, so what can I do? I just try to deal with the problem myself. It seems Australian embassy cannot help me. Well, staff working there may be not wrong, as they just do what they do. Just hope the government concerns about the hardship of its citizens. When I contacted the embassy, the staff there used to indicate that most of Australians here have to sent the form and photo back to Australia for completing the guarantor infomation section and then send it back. If this happens frequently, it does indicate that requirements are not quite reasonable, so I cannot understand why government just put it aside. For the Australian-born citizens, this should be fine. At least they know a lot of people satisfied with those criteria, but for the new citizens, it would be more difficult to find an appropriate person to become his/her guarantor, particularly when applying passport overseas, the criteria are even higher. For the guarantor requirement, I think it is really not reasonable. Some people just select dentists who just made a treatment for them 5 yrs ago to become their guarantor. Obviously dentists cannot recognise them, and they can only ‘know each other for quite a long time’ purely depending on the record of that treatment only. Yes, this does work. I just wonder this kind of ‘stranger’ can do the identification for the applicant, while the closed friends of the applicant may not. Is this logical? Also, for the photo, government staff cannot identify whether the person in the photo is the applicant when they interview the applicant? They lose this ability when they work in the government, or they cannot trust their eyes and only can trust other people to do that task for them? I really really cannot understand it. I think David M is just being a smart alec & his comments are not at all helpful. He has missed the point. I have just started the process of trying to renew my current passport which expires in 3 months so I am heeding recent advice & giving myself time before I am planning to travel o’seas. This morning, I ‘exceeded’ my logins for today & had to ring the department & get into the ‘queue’, something I was hoping to avoid by going online in the first place. After another attempt to get to the next stage of accessing the online renewal form without success, I shall endeavour to try again online t’row as I’ve just been advised to do. I am not going to hold my breath because I have had 2 name changes since my original passport some 35 years ago. Grit my teeth & try to ride it through to the successful end, I tell myself. So far so good…just lodged my passport renewal @ my local post office but oh, no…of all things to do, I wrote the year in the date incorrectly as 2011, not 2012! Fortunately, this was brought to my attention by the post mistress & after she made a couple of enquiries on my behalf, it was carefully crossed out (all in black ink), corrected & a carefully-placed initial by me (I was wisely instructed to make it a ‘very tiny initial only in the dark space & not to go into the white space’) so I gather she was showing her experience here. Now, my fingers & toes are crossed…I’ll wait to see what presents in the next 10-12 days or thereabouts. I am being positive but also not holding my breath here. how can i get this farm details.is it possiblefor me. im heading to the UK so i apply for a UK passport so i can actually do some travel rather than just get out of AUS.can you help me. if you think that is a nightmare, ive been going through this process for over a month now, with all the troubles you have come across and even more, since i was born after 1986 i need to prove one or both of my parents were Australian citizens at the time of my birth so i had to supply one of the following, my mothers birth certificate, my fathers birth certificate, or one of their passports, since i do not have any contact with my father i had attempted to talk to my mum, well guess what her name was spelt wrong on her birth certificate and not to mention she had changed her name and could not remember her middle name which is rediculous so i could not even apply for her new birth certificate since i did not have her full name, then i thought, so i went to the imigration website to get my 119 form (citizenship cert application form) filled out all the bull they needed, and again smacked in the face, i once again needed my parents birth certificates for this, so i just gave up for then, i had finally come to the end of this by finding an old passport of hers, well boy was i wrong, the passport needed to be issued before i was born for me to be able to use it, 6 weeks later and about 10 hours searching through documents i finally found her birth certificate with her name change, i thought its finally over i can finally get my passport, and BAMMM! got smacked in the face again i needed a guarantor that has a valid aus passport, which would be fine, until i found out it could not be a family member or a spouse or even family of the spouse, which has brought me back to a halt, still stuck with no passport. ABSOLUTE JOKEE! Sounds like I am not alone – what an absurd process to apply for a passport when I already have 1??? I have just finished applying online for a Victorian marriage certificate and birth certificate. Neither of these certificates that I have are OK with the passport checker at the post office. My birth certificate was issued in 1985 so while it is certified – it does not look like it has “come out of a computer” & my marriage certificate comes from the celebrant. I am now off to the police station to get a copy of my rates, passport (still current) and my medicare card certified. I then have to send these certified copies to the Victorian Registry of Births, Deaths and Marriages together with my receipt (from VIC BDM) & hopefully I will receive new copies (from a computer??) of these certificates and I will then be able to start filling out the form that I should have been able to do on line. Trying to apply for husbands passport who had previously applied successfully for a passport. Now found out that his birth certificate does not match his name on the register as someone made an error 45 years ago in the spelling. We are still trying to get a passport at this rate he may not get one in time and will miss our cruise. I can’t bear to go without him but don’t want to lose $8000 either! What a bummer! Michelle, hope you get it sorted out in time for the cruise! Hi there Audrey, consider getting in touch with your local Australian diplomatic or consular mission for advice about what to do in this situation. The potential hassles to get a new Aussie passport may mean that it’s easier to travel on you the Irish passport but the diplomatic or consular mission will be able to provide appropriate advice. I was just wondering if anyone born after 86 who has had the trouble applying for a passport happens to be adopted or deceased parents? I have pretty much discovered that I am going to have to apply for my Australian citizenship because there is no way I can obtain my parents passport or birth certificate. This is more than slightly insulting as I can assure you I’ve lived here for 21 years after I was born in this country, yet I’m not a citizen? Oh yeah, Took me around 2 months to get my Aussie one renewed because I lost the other one in the recent QLD Floods. Yet only 7 Days to get my New Zealand passport. Anything to do with the Australian Government, I always allow about 4 Months for processing, they are slow, overcharge and ask for such fiddly crap with everthing. Where he interfaces with the public whose servant he ostensibly still is and with every passing day, every international-travel &/or migration-related agency/secretariat/department’s average employee appears less “client” oriented – a little more fascistic. DIAC’s front-line folk are, if it’s possible, more arrogantly than many of the others, also becoming more authoritarian-regulatory, by the day. And when one considers the obscene amounts of money those departments and agencies and so-on already consume and that Aus “public ‘servants'” are already sitting about on our Dime — and are being paid at least 30% above the national average pay for similar positions — where in Hell do they get off charging We, The People – who are already working several months per year to feed them – so damned much money for so damned little service? Let alone civility? I too have a smiler problem. After arriving in Australia on my (Australian Born) Mother’s passport in 1971. Going through school, getting my drivers license, registering to vote, receive a medicare card, paying taxes with my tax file number and paying rates and bills, etc. Now in 2014, I thought about going overseas. I visit the Post Office, they gave me the Passport form to fill in, I come to the point, where it asks for proof of citizenship, and because I do not have an Australian birth certificate or citizen certificate, I must apply for a citizenship. (Now I feel like an illegal immigrant) All these years I thought I was an Aussie. So, here we go, citizenship application. Mums old passport, long gone. Birth certificate, never had one. How on this earth can I prove I am a citizen, if they will not except all the proof I have available (stated above). Any ideas, how to overcome this problem, or who to contact that could help? Hi Frustrated, you may want to get in touch with the Australian Passport Information Service who should hopefully be able to help you out. Still having trouble with guarantor here! I am in the US trying to get passports for my children and I have the citizenship certificates now but the passport application you have to get the guarantor to fill out on-line. This means they have to log in and enter their birthday before I can print! Crazy! Or I can request a blank application and hand-write the whole thing. Why can’t I just print that one page for the guarantor to fill out? Why is it either all or nothing? He is a doctor and doesn’t have time to log in and all that, he just wants to sign the thing and get on with his busy job. Also, asks for his d.o.b. which is more personal info that they asked for in the citizenship app. You would think citizenship apps were more intense than passport apps. Apparently I don’t match up with the Australian online form either … What a frustrating process. Not looking forward to the phone call Monday and I have a feeling they will make me get a new one. Same boat. Born here in 86. Parents both listed as born here. Person listed as father apparently had a partial transgender operation at some point between 1992 (last contact with them) and 1998 and assumed a new name without changing it. Name listed as my mother was never actually used by my mother, who assumed names frequently. Had to change my name just to obtain a birth cert. when I got married as I had also never used the name listed for myself on the birth certificate and all ID was in a different name. No way of contacting parents, or obtaining information on them. To my knowledge neither had a passport, and my mother didn’t even have a license. We haven’t been in contact in 15 years. Because my name was altered so many times growing up, I can’t prove I lived here for the first 10 years, despite never having a passport and having officially changed my name. So I can’t apply for citizenship either. I know nothing of grandparents on my ‘father’s side, and I only know of my grandmother on my mother’s side, who was fostered and therefore used a different surname than from her birth (fortunately, I do know her original surname), I know the name of the lady who fostered her, but not her husband’s name. My grandmother was born here in 1955. But apparently I still can’t be an Australian citizen? And to think, all of this just so I can take my kids on a trip to Disneyworld. And FYI, I can’t get THEM a passport either. And I have just spent 2 HOURS in the queue to the dept of immigration and am still 42 in the line. Just realised my Aust passport will expire in 4 months so need a new one to travel to Thailand next week( need to have 6 months validity) Tried to renew priority service on line. (Claim it is possible to get in 2-3 days) Press some keys wrong and the site logged me out. Phone the 131 .. number up. The lady was not helpful, told me she could not unlocked. I should be able to access again in 24 hours. I have no hope of getting it on time at this rate from the above comments. Has anyone tried to apply for priority service before? I think some of you commenting here need to read and comprehend the form. Your guarantor does not need to have a current Australian Passport, there are two choices on the form. Current passport or have been at their current residential address listed on the Electoral Roll for the last twelve months. If you cannot even understand those options I am not surprised you are having problems with the process. I have had Australian passports both before and after marriage, but I let my last one lapse for a longer period of time (no money, no travel!) anyway, we are going on a cruise next year, and decided to r apply (not renew, as its been to long) well, my problem is proving my name change. I have. birth certificate- original. and I have an older passport with my name change due to marriage (25 years ago!!!!!) but it seems my old passport isn’t viewed as a good enough evidence of change of name, no any current cards/ licences. even though I have been with this name for 25 years!!!!!! how crazy that I have to pay for my marriage certificate!!! SO STUPID.